Petrol in Delhi will cost Rs 61.13 per litre from midnight as against Rs 61.87 currently, said Indian Oil Corp (IOC), the nation's largest fuel retailer. Petrol price was on Friday cut by Rs 0.74 per litre and diesel by Rs 1.30, reversing the 2-month trend of rising rates. Similarly, a litre of diesel will cost Rs 48.01 compared to Rs 49.31 at present. The reduction comes on back of two straight increases in petrol prices - Rs 3.07 a litre on March 17 and Rs 2.19 per litre on April 4, and four straight hikes in diesel prices. Diesel price was last hiked on April 4 by Rs 0.98 a litre and three previous increases totaled Rs 3.65 per litre. "The current level of international product prices of petrol and diesel and Indian Rupee-US Dollar exchange rate warrant decrease in price of petrol and diesel, the impact of which is being passed on to the consumers with this price revision," IOC said. 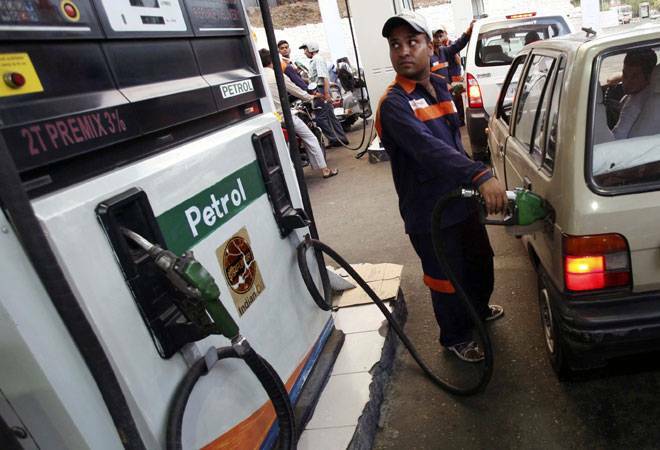 State-owned fuel retailers IOC, Bharat Petroleum Corporation Ltd (BPCL) and Hindustan Petroleum Corporation Ltd (HPCL) revise rates of the fuel on 1st and 16th of every month based on the average oil price and the foreign exchange rate in the preceding fortnight. "The movement of prices in the international oil market and Rupee-USD exchange rate shall continue to be monitored closely and developing trends of the market will be reflected in future price changes," the company added.